If you’re trying to get rid of some dark spots, age spots or sun spots but you’re not willing to go and check the issue with a professional dermatologist, you’d better take a leap of faith with one of the most popular (and inexpensive) options available over the counter. 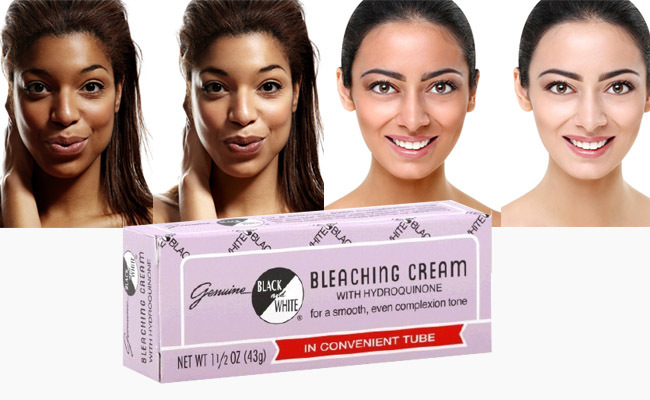 We’re talking about the BLACK and WHITE BLEACH CREAM, a whitening cream that can work wonders, if you’re patient enough. Quick note – what’s the fuss about hydroquinone? First thing first: stay safe! The cream is included in the whitening creams categories not only because of its formula, but also because it actually works. Truth be told, it would have been pretty impossible for the cream not to work as it’s based on hydroquinone. The magical ingredient, hydroquinone isn’t the only one though and the cream also includes other ingredients that are well known for their whitening abilities. Hydroquinone is one of the most popular and most efficient chemical ingredients known to mankind when it comes to whitening the hyperpigmentation conditions. A lot of its popularity is caused by the controversy around it. Even though there have never been direct and clear connections between hydroquinone and cancer, there are still some voices around the world that blame it for causing cancer. This is why, in some countries, hydroquinone has been forbidden for some years now. Nevertheless, the doctors have decided that a cream based on maximum 2% hydroquinone is safe to use, with no prescription. However, any concentration higher than that must be checked with a specialist, and used under medical surveillance. Long story short, you can safely use any hydroquinone-based off the counter as long as it doesn’t contain more than 2% hydroquinone. What’s far more important when using a hydroquinone product is how to use it and what rules to follow in order to stay on the safe side. One thing to also take into consideration: hydroquinone isn’t the only whitening ingredient out there. It’s simply more popular and part of that popularity comes from the controversy it still stirs around the professionals. As hydroquinone is quite powerful, you need to be cautious and keep in mind some tips. For instance, some like to only include it in the night routine, before going to sleep. If you want to speed up its results (hydroquinone doesn’t work wonders after one night and it shows results kind of slow), you may use it twice a day. If you’re also applying in the morning, you should always follow it with a sunscreen as skin gest sensitive during a hydroquinone. Some go the extra mile and cover the areas treated with hydroquinone for as long as they’re using it. Don’t fall into the trap of thinking that if the cream is cheaper, you should skip some safety rules. It’s still based on hydroquinone and it’s the other ingredients that make the difference between a $10 cream and a $30 one. Apart from the famous and infamous hydroquinone, the cream is also made with mineral oil, ascorbic acid, citric acid and some other chemical ingredients. In case you don’t know, each of these ingredients is also able to whiten the skin, increasing the efficiency of hydroquinone. Therefore, the cream is going to fade away the skin discolorations, evening the skin tone. If you’re currently dealing with freckles, liver spots, age spots and dark areas, there’s a pretty good chance for the cream to slowly remove them. But you need to keep in mind that it doesn’t happen overnight and it may take you even three months until you see the obvious improvements. It’s good to note that the cream is able to diminish the appearance of chicken pot marks. It may take up to a year, but…good things come to those who wait! The cream is rather strong so if you know your skin is sensitive, you should run a patch-test on a small area inside your elbow and leave it up until the morning. Additionally, the cream may be used only on adults and children older than 12 years. Try to apply it in thin layers and always pay attention to your skin reactions. If you want to use it for a kid younger than 12 years, you should ask the doctor. You’re going to find the cream rather on the thicker side, but this only makes it easier to dab it on the affected spots. The cream comes in a tube so it’s very easy to use for most. One thing that we really don’t like is the plastic cap that breaks quite easily, causing a mess. A little goes a long way so the tube is going to last for quite some time. It may even hold for six months with a twice a day use, which is pretty impressive. If your skin is a tad oily, you’re not going to use a moisturizer afterwards. Even though it’s thick, the cream doesn’t feel oily and stays in place pretty well. Another benefit that some noticed: the make-up lasts longer thanks to the cream so that’s a bonus that not many anticipated! Due to its strong formula, the cream is able to lighten the skin tone and to eliminate dark spots or freckles. It also gives your skin a nice and smooth platform to use before applying your regular base. Some use it after taking make-up off. The best way to decide is your routine and your skin. See what works the best for you. You may also want to use it all over the skin in order to maintain a balanced tone. So, if you’re an African-American that is trying to brighten the overall complexion, the cream is one great and economical choice. Despite being rather strong, it’s not common for the cream to dry our skin nor making it too oily either. What you also want to do is to get also a good 30SPF sunscreen so that you don’t cause any other skin issues. If your skin is acne prone, the risk for breakouts is a bit high. 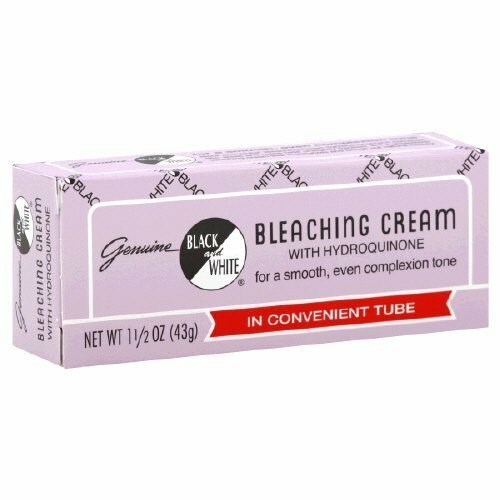 The Black and White Bleaching Cream is highly efficient and removes dark spots, freckles, age spots and various skin pigmentation. You may use it on your face but also on your body. It may even work on chicken pox marks, if you’re patient and persistent. You need to remember that the cream doesn’t work wonders overnight and you do need to give it time until it shows the results. Try to stay away from the sun and always put on some sunscreen after applying it. As long as you’re not skipping on the safety rules and wait long enough, you may even get the skin whitening that you were expecting. But not until tomorrow, for sure.